The ExpoDisc Neutral White Balance Filter allows digital photographers to quickly and easily set an accurate custom white balance. Each ExpoDisc is individually assembled, calibrated and certified for neutrality in the visible spectrum, and for 18% light transmission. The ExpoDisc can be used on-the-fly to set a white balance in-camera when shooting JPEG, or later in post production when shooting RAW. Using an ExpoDisc to set a custom white balance results in consistently balanced color and eliminates many of the yellow, red and blue color casts commonly seen in digital photography. The ExpoDisc is easy to use. 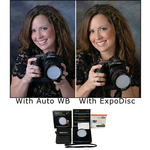 Setting a white balance with the ExpoDisc eliminates many of the inconsistencies and inconveniences associated with using white balance cards and targets, including unwieldy size, unwanted reflectivity, improper angling, and shadows. To set a white balance with an ExpoDisc, simply take a photograph of the light source (incident light) through the ExpoDisc, then follow your camera’s instructions to set the camera’s custom white balance. Because the ExpoDisc is calibrated for an 18% light transmission, you can also use it as a reference tool for manually determining proper exposure. The ExpoDisc is available in a variety of sizes to fit most popular lenses. The ExpoDisc does not thread into the lens; instead, its quick mount design can be pushed-on and popped-off to facilitate a quick white balance. ExpoDiscs do not screw in. 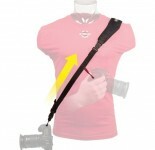 They lack front threads and were designed to be pushed-on over the lens threads in order to facilitate a quick white balance.